Armada® BFOU Offshore Fire Resistant Power Cable 0,6/1 kV | Belcom Cables Ltd.
For fixed installations offshore units in all locations. Cables for power circuits where shielding is required or areas that require additional protection against possible shock. 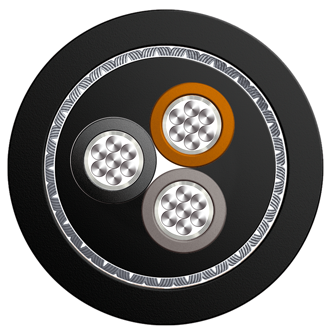 All cable materials are free of halogens, with low fumes emission, fire retardant and fire resistant. These cables are especially suitable for the installation in ships in power, lighting and control circuits. Insulation Mica tape + Ethylene propylene, type EPR according to IEC 60092-360. Armour Tinned copper wire braid. Outer Jacket Mud resistant thermoset compound, black colour, with low smoke and halogen free under fire conditions, type SHF MUD.